I am still plugging away at my Quicksilver. I have two mesh sections and one garter stitch section to go, and then it will join my collection of UFFOs (see this post for an explanation). I am hoping it will not stay there long as I’m very excited to see how it will transform once blocked. 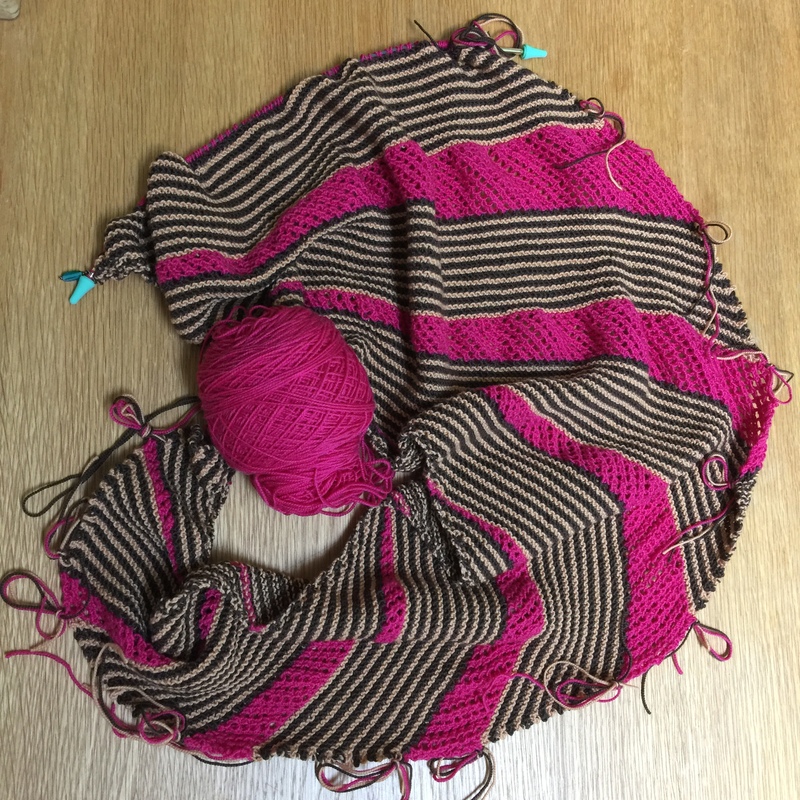 I’ve been looking at this brilliant thread on Ravelry and so am very excited about the blocking process. This project should benefit particularly because, even though the mesh isn’t really what I’d think of as “lace”, it’s still got a lot of stretch to it. And, the striped sections are in garter stitch, so there’s a lot of room to grow there. I’m hoping it will expand in size quite a bit! I revisited another skill that I’ve used in the past but not for a long while: dropping a stitch on purpose to fix an error in a previous row. I made it maybe ten rows without realizing I somehow purled one random stitch in a striped section. So, when I got to that spot, I dropped the stitch above it off the needle, pulled it out until I got to the purl stitch, and reworked up the ladders. It got a little fiddly and took a long time, but I know that it would have otherwise bothered me forever. So, I consider it time well spent. Also, it’s good experience! I discussed in Quicksilver and the Importance of Good Knitting Needles how I was going to transition my shawl onto a longer pair of circs. Well, that didn’t end up working out. It was great to see the work spread out instead of completely scrunched up, but my gauge with the other needles was much looser. Even though the needles were the same size! I guess there was something about the texture that cause me to knit looser. So, I crammed it all back on the shorter ones. If I have a chance to buy another circ before I finish the shawl, I will…but it’s looking like that might not happen. Other knitting news: I will be doing my first test knit! I’m really excited about it. More on that later! Also, I actually started sewing the ends in on my Old Shale kids blanket yesterday. That will be slow work but is necessary and totally worth it. 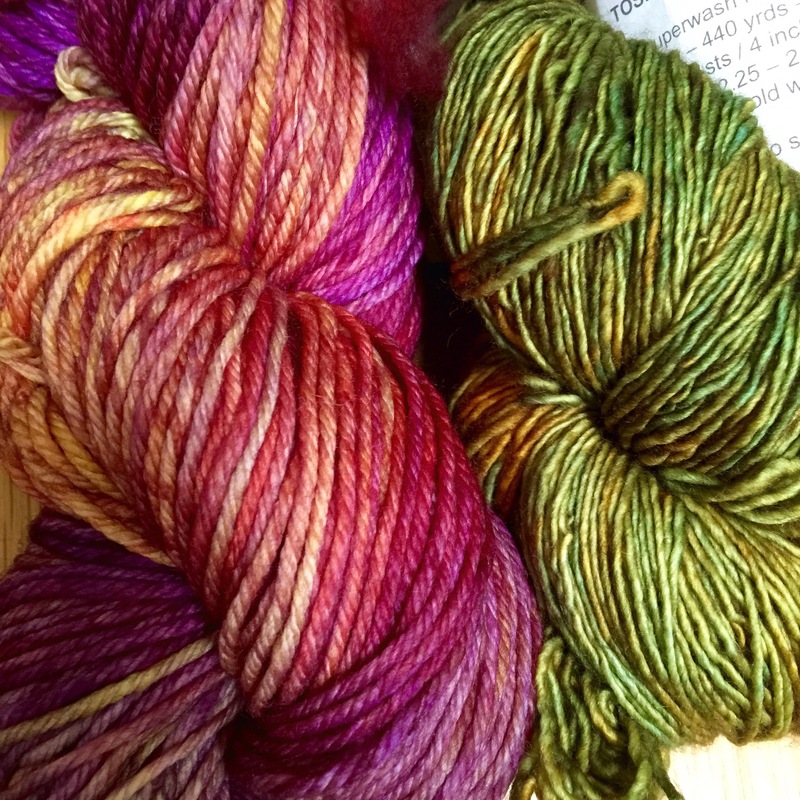 Yarn news: I got my hands on my very first Madelinetosh yarn yesterday. It is very, very pretty and I love it. I also got a couple of skeins of Malabrigo (not my first on that one, but only my second) which is also downright beautiful. You can see them both in my stash if you like. They are both squooshy and delicious and I want to knit them right away and save them forever, at the same time. Hopefully for my storage space, the knitting will win. One aspect of depression (remember that? depression?) for me has always been procrastination. One great way I’ve found to procrastinate is to become thoroughly engrossed in something else. Well, sometimes knitting becomes that “something else”, as knitters everywhere will be shocked to learn. I have (had) several very important things to do for work and the deadline for many of them happens to be today. Over the past few weeks, I have done a good bit of knitting, but have not worked on these things at all. I am proud to report that I spent a good bit of this morning doing all those things due today. I took a break to knit a little and have some lunch…and maybe write this blog entry…and am determined to get back to work afterward and knock out the last outstanding thing that needs done. And then maybe do some more knitting! Thank you! It’s the first time I’ve done anything like it. Ooh! Lovely new yarn! I really like those colors.